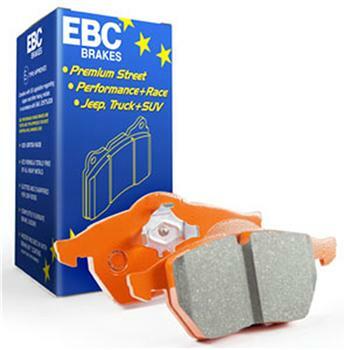 EBC Brake Pads - Orangestuff 9000 Series - Lightning Motorsports - Selling Speed since 1996 ! In its third year of use the Orangestuff compound has proved to be a great solution for medium/longer duration race use than its famous stable-mate the Yellowstuff brake pad grade and a great drive to drive away pad for Trackday driving. Users are reminded to follow the bed in instructions below which are unchanged and to realize this is a harder longer lasting material, the hardest in the EBC Brakes range and needs proper bedding to decent and flat discs. Final “Lapsim” formulation curve of the latest material which is called DM2323 is shown below. There are three curves below. 1) The top curve has blue lines which are the friction level with the stop number shown at the bottom during the bedding process which is 25 stops. The red lines on this curve are disc temperature at the start (not finish) of the brakes cycle. 2) The Middle curve is the first Lap simulation race test, again blue lines are friction and red are disc temp. This simulates a 10 lap race at brake effect of 0.7G. We also then ran this same test at 1.0G decels and those results are shown in Lapsim 2. 3) The lower curve on Lapsim 2 is the toughest test we can really do on a dyno, simulates massive brake energy and discs glowing bright orange through the brake cycle, highly doubtful any driver would race to these temps but the pads still held on to a very decent level of friction. Important to note that on this second test the cooling was halved, simulating a poorly vented brake system that can occur on street based cars without improved ducting. The disc temps shot up to over 1000C here at the end of the stops and the friction dropped but there was still a decent brake effect as shown below. This is an unusual test to do and not realistic but this was a test to the very limits and Orangestuff survived. We also doubt if any manufacturer would ever A) Run or B) Dare to publish such results but there you go.